by Brianna Crandall — August 22, 2018 — Ergo Impact, the office furnishing and wellness brand working to revolutionize ergonomically engineered office products, is re-introducing its award-winning LeanRite standing desk chair and presenting its new MassageRite pillow massage accessory at this week’s ErgoExpo in Las Vegas. 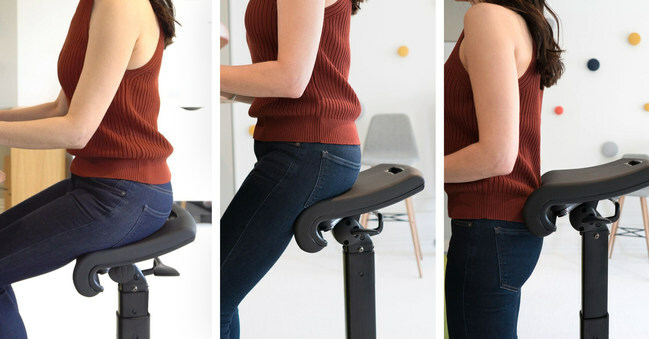 The LeanRite is touted as a one-of-its-kind office chair for standing desk users that seamlessly blends ergonomics and orthopedics, allowing health-conscious desk users to combat the negative effects of prolonged sitting by easily shifting between several positions: sitting, standing, leaning and perching. 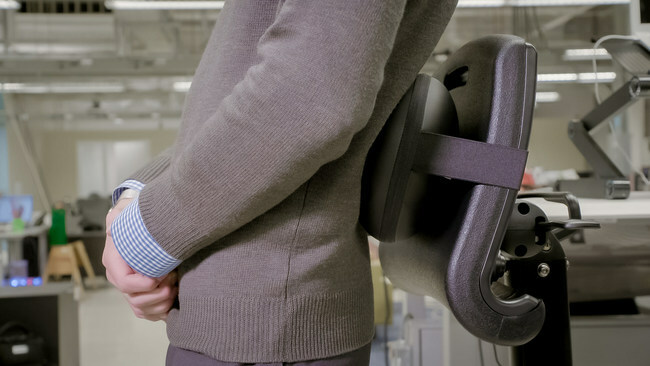 The new MassageRite is a heated and portable shiatsu massage accessory that attaches directly to the LeanRite standing chair. MassageRite adds the benefits of a deep-tissue massage “sans the expensive appointment or oversized massage chairs,” says the company, to provide comfort and relief from back pain. The MassageRite is designed to help to decrease blood pressure and heart rate, taking the cardiovascular benefits of this sit-stand chair one step further. Ergo Impact cited research published in The Journal of Alternative and Complementary Medicine (2008) that found subjects receiving deep-tissue massages experienced a reduction of systolic blood pressure of 10.4 mmHg, diastolic blood pressure by 5.3 mmHg, and a mean arterial pressure reduction of 7.0 mmHg. Heart rates also lowered by 10.8 beats per minute. As an example of the user benefits, the company quoted a LeanRite user who rated the product 5 Stars as writing: “I am young at 38, but have terrible congenital back issues, which makes sitting painful. I love how I can lean into the LeanRite or lean back into it, which makes me able to stand for longer periods of time.” Now with LeanRite and MassageRite together, users can strive to both manage current back pain problems and undertake preventive measures, says the company. Ergo Impact invites ErgoExpo attendees to visit booth 318 and experience firsthand how the new combined offering provides both a comfortable support system while standing, and acts as an office Wellness Station for occasional rest and relief. For more information or to view videos of the products, visit the LeanRite and MassageRite (MassageRite video) product pages on the Ergo Impact website. NeoCon 2018: Steelcase’s award-winning furniture collection features a height-adjustable cantilever worksurface for both focused work and collaboration July 13, 2018 In "Products and Services » Furniture & Furnishings"
NeoCon 2018: If you’re looking for a sit-stand workstation that has a better chance of being used, check out this new one designed for convenience August 8, 2018 In "Products and Services » Furniture & Furnishings"
Check out RAVE Reviews’ 2019 top picks for office chairs — with choices to fit everyone March 27, 2019 In "Surveys and Trends"